Nissan’s chief performance officer, José Muñoz, will be honored with the prestigious Industry Leadership Award during the SAE Foundation 2018 Annual Celebration, which will be held in May. Muñoz will receive the award for achieving a significant level of success in his STEM career and demonstrating how to be an innovative risk taker who continuously challenges the industry. The main goal of the Annual Celebration is to honor professionals who are making a meaningful impact in industry and to raise funds to equip teachers and students with high-quality, research-based STEM education. 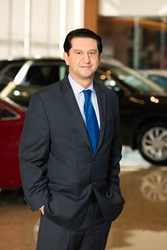 Muñoz was appointed chairman of Nissan North America in January 2014 and chief performance officer of Nissan Motor Corporation in November 2016. In these two critical roles, he is responsible for the overall performance of the company as well as overseeing Nissan’s operations in the U.S., Canada, and Mexico. Having a doctorate in nuclear engineering, he knows how important STEM education is and that it's not just about becoming an engineer, working in a lab or building robots. It's about developing versatile skills that are in high demand in today's modern, global marketplace. Nissan has made significant investments in STEM education and has been a valued partner to SAE. In 2007, Nissan Motor Company announced a generous contribution to the SAE Foundation for the development, testing, and launching of SAE's A World In Motion® (AWIM) primary learning materials. These cutting-edge STEM education activities were launched in 2012 and are the most highly acclaimed and sought-after STEM programs in grades K-3. Nissan continues to support AWIM in classrooms in various Nissan communities including Michigan, Mississippi, Tennessee, and Texas. Based on surveys, 72% of students experienced a significant increase in math and science scores, and 84% of students displayed a positive change in attitude towards math and science after their AWIM experience. For more information about the celebration, visit http://www.saefoundation.org/banquet/. To request media credentials to attend the event, email shawn.andreassi(at)sae(dot)org or call 1-724-772-8522. The SAE Foundation increases student participation and achievement in science, technology, engineering and math through educational programs, including A World In Motion® and the Collegiate Design Series™. SAE International is a global association of more than 127,000 engineers and related technical experts in the aerospace, automotive and commercial-vehicle industries. SAE International's core competencies are life-long learning and voluntary consensus standards development.